Metal detecting: Honesty IS the best policy! My central contention is that a large number of clubs present themselves as guarantors of virtue while leaving scope in their rules for individual Members to mislead landowners and/or not report finds. And no, that’s not an unsubstantiated accusation, I can prove it. The killer issue is this: most of them make a big noise about how their members must comply with the National Council of Metal Detecting Code of Practice but (unknown to the landowners) that code is rubbish, it leaves adherents free to ignore the official Code of Responsible Detecting. This accusation comes with an invitation to prove me wrong: let them make full adherence to the Code of Responsible Detecting a strict condition of membership. No-one could then accuse them of supplying irresponsible Members with the means to mislead landowners. 1.Prince Bishop Metal Detecting Club (again): “As an act of openness [!] we are always willing to discuss with landowners the finds that come off their land”! How kind! But it translates (doesn’t it?!) as : “We’ll show you only if you ask, otherwise the stuff is ours and we’ll take it home with us”. 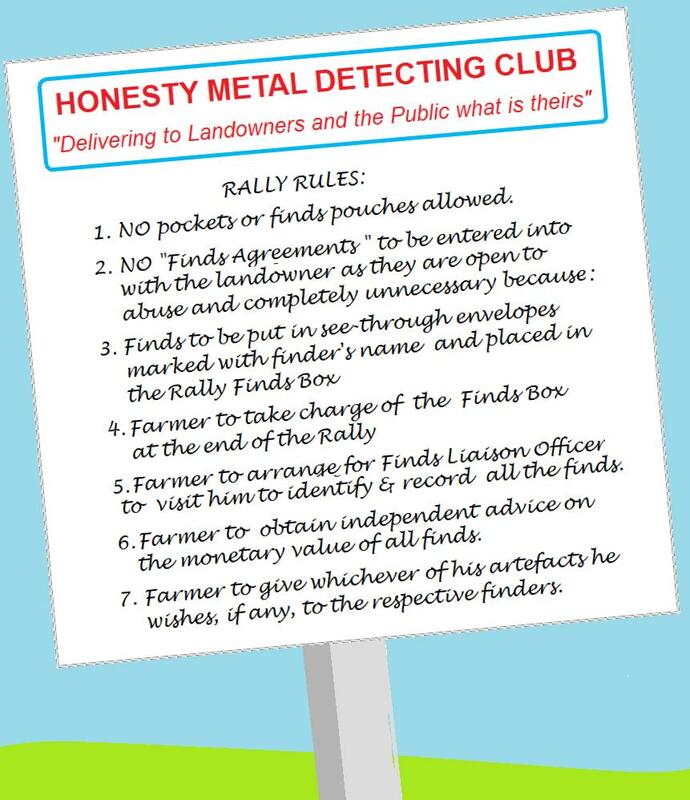 5.West Kirby Metal Detecting Club has yet more tricky words that will fool farmers – a Code of Conduct that tells members “Report any unusual historic finds to PAS”. Trouble is, that’s NOT what the official code of Responsible Detecting says, and it’s a deliberate weakening of it. By specifying “unusual” (which appears nowhere in the official code) it is left purely to the club member what he reports and what he doesn’t while giving farmers the strong impression the club rules require 100% recording and Official Code compliance. They don’t. 6. Yeovil Metal Detecting Club leave the barn door wide open for those that want to mislead farmers. They say they are “happy to share any items of value on a 50/50 basis” (patronising or what, considering they don’t own a molecule of them?) and they will “report all worthwhile finds and findings to you”. Thus, neatly, they ensure (a.) what is of value, (b.) what is to be shared and (c.) what is to be shown to the farmer all remain entirely for the judgement of the detectorists. WHY? Do farmers ever get ripped off in the Yeovil area? Have a guess! 7. Solent Metal Detecting Club opens the barn door by a different method: it tells members that finds “may” be recorded with PAS. Of course, saying “may” is also saying “may not”! “May” is only a word but it can make a villain look like a hero – and it wasn’t chosen by chance. There IS an interim solution, and it’s below. It borrows the Prince Bishop Detecting Club sentiment about honesty being the best policy and applies it for the benefit of landowners and the general public. I’m sure “et al” know it would be a Good Thing and that it would be simplicity itself to achieve, they would just need to advise landowners to adopt it, for their own sake and the good of the resource. One full page ad in the farming press would do more good for those that deserve it than thirteen years of uphill outreach! Some people might object but advising farmers on the conditions they should lay down for access to their own land is not exactly unreasonable, the dimmest of MPs and BBC producers would see that, so the non-recording and pocket-loving sector of the metal detecting community would be left as the only objectors. So will “et al” say….. Them that asks no questions isn’t told a lie, Watch the wall, my darling, while the gentlemen go by? “Et al” can make the adjustment when they place the advert! But Nigel, is not the NCMD Code of Practice the one that the “Fizzy” metal detectorists’ survey refers to? I guess you mean the survey of metal detectorists that ex FLO Felicity Winkley is conducting “to assess the effectiveness of the Portable Antiquities Scheme”? You’re right, she asks them if they abide by the rubbish NCMD Code not whether they abide by the Official Code of Responsible Detecting !! Why would she do that? Ah yes, she has “the backing of the NCMD” to conduct the questionnaire. Not likely they’re going to back her to ask the embarrassing questions is it? Just shows how far the bamboozling has gone if academics can be so completely misled. What chance have landowners and the general public got? Interesting and thought provoking post. My concern however, is that many farmers I come across don’t really give a hoot about history or the curatorship of thier land other than as a means to provide an income to themselves. I can see most farmers just chucking finds into a bucket as either scrap or as some curiosity that they don’t really know or understand- A real shame. Well, that’s the hillbilly characterisation of farmers that a lot of detectorists put forward as their reason for not reporting their finds to PAS. (“Most of my farmers won’t let me”). My experience of farmers is that on average they’re a lot better educated than most metal detectorists and are being represented as otherwise as an excuse. In any case, if people metal detect knowing the farmer has said he won’t allow reporting then they are in breach of the official Code and they not the farmer are at fault. It is not a general hillbilly characterisation, hence my use of the word ‘Many’, and this comes from someone whose father and family are farmers, hence my respect for farmers and agriculture. I just think that relying on farmers to record finds is expecting a bit much. I’m sure many would say they would but reality would be somewhat different. You actually also said ” Most “. If ” Most ” farmers treat historical knowledge with contempt that’s not a great concern since most metal detectorists do exactly that anyway. If on the other hand, as you now suggest, only “many” farmers do so then putting them in charge of the process would be a big step forward as they’d report more than detectorists do. The additional advantage of the “Farmer in Charge of the Finds Box” concept is that the FLOs would get to see everything, and wouldn’t need to attend rallies at great expense to the taxpayer and could do their “outreaching” at detecting clubs or elsewhere. Truth is, the only reason the FLOs attend rallies is for the convenience of detectorists – they need to examine the finds on the day, before the detectorists take them home with them. If the farmer keeps them (and they ARE his property) the FLOs can look at them at their leisure. Mr.Swift,may i suggest you get down off of your rather shaky soapbox and commit your energies toward a more positive direction.Yes,there are miscreants in every strata of society,but does that give you the license to slander the principles of any group of people,i would suggest not.P.S My first ever(and only first of two) gold coins i gave to the farmer without any encouragement from him,it was a pleasure to give and not take,hmmm now why does the word Banker spring to mind,anyway enough of my waffling….be positive ! I will take your advice about being positive when you deliver everything you find to the rightful owner and then follow the principles of Ethical Detecting http://www.ethicaldetecting.org.uk/ (You can call THAT a shaky soapbox if you wish but it won’t make it so). Mr Swift, i wish to thank you for your posting of various club rules and you interpretation of them. Having followed your link to the Ethical Detecting principles i am distressed to find that i am not an ethical detectorist due to the fact that i show all finds to the landowner and not just the ones that i think are of interest as stated in principle 3. ” Members will never ask landowners to enter into “finds sharing agreements” but instead will promptly deliver ALL finds of interest into the hands of their legal owner, the landowner, so that he/she can consider what (if anything) should be done with them “. Thanks but i will stick to my own code. That’ll be your own code whereby you unilaterally decide what happens to someone else’s property will it? Very impressive. As for our “interpretation” of the club rules, all we have done is point out they fail to make adherence to the official code and the reporting of all finds to PAS mandatory – something which all irresponsible members are obviously satisfied with (“it’s only a volunty scheme innit?”) and which all thinking members ought to hang their heads in shame about. Simple really. But thanks for your input. I am rather concerned that the author of this article has not had the forethought, decency or indeed sense to contact and speak with the committees / members of the clubs he uses to support this bigoted and disturbed view of Metal Detecting clubs. If this person had spoken with the clubs he misuses in his bilious interpretation of their constitution / rules , he may have found to his astonishment a level of responsibility that is worthy of renown; instead he offers up an intolerant and flawed view of their aspirations for safe, honest and responsible metal detecting. I do appreciate that there are a number of clubs or individuals who treat metal detecting in a manner fit only for the gutter; however night hawking and non recording is not an option to must of us, that said it is a problem that can compromise the hobby and for this reason most clubs do everything in their power to highlight these issues and endeavor to stamp it out through selective membership. Generally good clubs vet potential members before allowing them membership, furthermore clubs are more often than not aware of the local reprobates who would damage the hobby and therefore will not allow such people to become members. Having clubs that are doing their very best to safeguard the hobby, artifacts and landowners should be applauded and not misrepresented in the defamatory manner that this article offers. The article cites seven clubs whose rules are clearly contemptuous of the rights of landowners. In addition hardly any clubs make adherence to the official responsibility code mandatory. Not all clubs have websites, those who do do so in an effort to be open and honest and to emphasise their willingness to adhere to the restraints the hobby and PAS asks of them. Woefully this article has taken that genuine openness and without consultation with any club seen fit to demean the well intentioned ideals most clubs strive for. The later statement ‘facts not opinions’ is a surly part of an attempt to try and edge metal detecting into a world on the edge of rottenness. However the arrogance of the writer is risible, how can he offer up his twisted bias on club rules based solely on seven clubs honest efforts to be open and truthful, he has not taken the time to clarify what these clubs try to offer or indeed sought out any input from any of the 100’s of clubs involved with this hobby. Therefore I suggest that this article is so dubious and flawed in it’s one sided construction it should never be taken seriously by any person who considers himself to be an honest, upright and a genuine supporter of this wonderful hobby and PAS. Rubbish. People who (a.) don’t hand everything over to the owner instantly for him to decide what happens to it and (b.) aren’t committed to follow the official Code are not acting in an open or responsible fashion. Attacking the author can’t conceal those 2 basic facts and the more it’s done the more obvious that is. Ethical detecting? ?, when clubs search on their landowners fields they pay that landowner a fee from between £ 5 to £15 per man this is understood by all parties as payment for potential general finds that may come off during that dig, therefore apart from treasure or anything of true high value finds has to belong to the finder. You suggest that any finds should go to the rightful owner (landowner) however if a fee is paid for potential finds up front who is to be considered the rightful possessor?, the landowner has in fact been paid for those potential finds already and already mentioned he / she still holds a genuine and real access to the rewards that treasure or high value finds may bring. Very often no finds come off at all, would you therefore suggest that the landowner gives back the fee to those who have paid for the right to detect on their land?? What we suggest is that to get a farmer to enter into an agreement for the detectorists to own things below a certain figure on the basis that the detectorist alone makes the valuation and the landowner doesn’t see the object is outrageous. Would you be happy to hear your granny had entered into an agreement with a bunch of day trippers from Liverpool, Leicester and Latvia to clear her loft on that basis? Of course not. You’d be scandalised. How metaldetectoristic! Simply denying the reality rather than facing up to how unacceptable it is. Would you be happy to hear your granny had entered into an agreement with a bunch of day trippers from Liverpool, Leicester and Latvia to clear her loft on that basis? Mr Harrison, when this flat fee of “five to fifteen quid” is agreed, can you assure us that the farmer is handed a stack of hobby magazines to leaf through so he can see if this is a “fair deal”? I have a random recent copy of “the Searcher” in front of me and in the finds valuation section (by Pete Spencer I think, isn’t it?). I’ll read the values: 230, 500-550, 20, 35, 50-60, 20, 80-100, 50, 50, 300-400, 400, 6–70, 150, 35, 50-60, 60-80, 40, 90-100, 20, 20, 50 quid It’s even worse if you look at the “Treasure hunter”, a random recent number also on my desk. Just in front of the PAS annual report (!) is the auction roundup: 726, 907 1210, 968, 2057, 7260, and so on – for three pages, the 726 quid one being the cheapest. I think you’d have to be a pretty thick farmer to let an artefact hunter on the field and let him walk off with anything they find paying just a fiver when you can see there is NOTHING in the valuation section of either magazine worth as little as a fiver. It is my suggestion that in fact if we had access to “landowners and clubs [to] find out what really goes on” we’d find that landowners have not been shown black on white what artefact hunters are walking off with week in week out. As for the PAS, how would they know about the details of prior negotiations with the landowner? This is not in their remit to discuss. The point is about informing the landowner of the potential value of what people may find, not in the Treasure alone but precisely among the saleable minor (non-treasure) items. You must agree that its pretty easy on a productive site in the present situation to pay a fiver and knowingly walk off with finds worth 100, 200 quid by Mr Spencer’s valuations. What is being said here is that its only honest and fair (if nothing else) to keep the landowner – the only owner of those items – properly informed of the true situation. And you are not paying for the finds, but access to the land. You can legally no more walk off with finds without the farmer’s say-so than a carrier bag of carrots growing in the field next to the search area. Or if you pay a five quid entry fee to a stately home, you cannot help yourself to the cutlery from the sideboard, can you? Mr Harrison, we haven’t published your reply as it was more of the same, totally ignoring Paul’s points. He has totally demolished your case. Further, you make a desperate and silly attempt to spin “As an act of openness we are always willing to discuss with landowners the finds that come off their land” as something open and reasonable. Willing to discuss, indeed! Arrogance personified – over someone else’s property! No, your club has been operating on oik rules, for the benefit of oiks and you’ve now shown everyone that you know it does.